When looking for inspiration for your summer holiday wish list, it helps to turn to those who are lucky enough to wear clothes on a beach (practically) for a living. No, we’re not talking about lifeguards or pro surfers, but the super-blogger set who get to list travelling as a key part of their job description. Fashion blogger beach style is almost an art form in itself, but it's something that we can all adopt a slice of when heading off into the clear blue—or just looking to update your summer-in-the-city wardrobe. The things in these girls’ suitcases have a habit of becoming cult items quickly. So what is this year’s answer to the Kiini crochet bikini? Or the personalised sun hat? We have joined the fashion bloggers on the beach (via the magic of Instagram, of course) to spot the key must-have pieces to buy for your own summer holiday. Style Notes: If you’re in the market for Instagram likes, you can’t beat emoji-fied espadrilles. 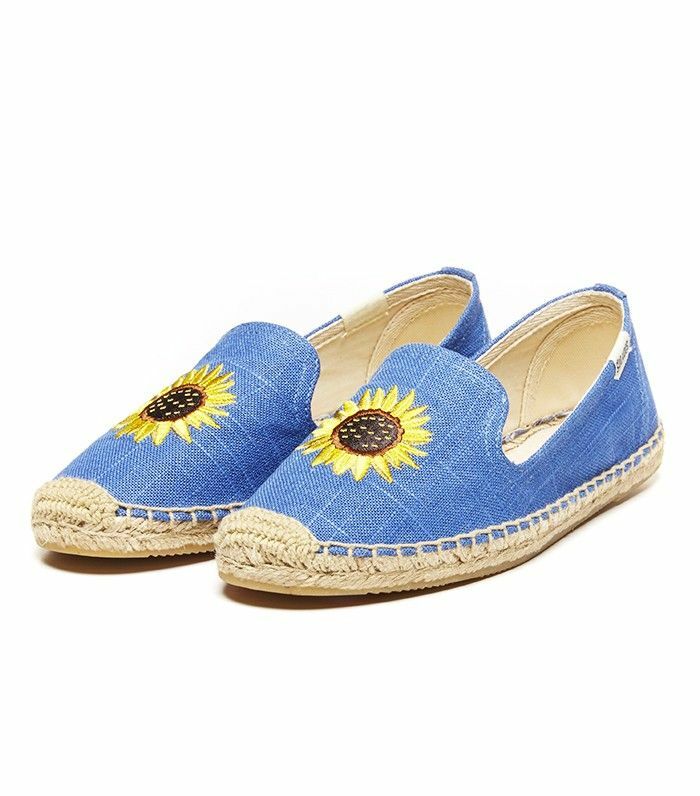 While holidaying in the Riviera, Julie Saranana showed that these Soludos slippers with embroidered sunflowers will brighten up any look. The only hard part will be choosing which style to go for. Style Notes: Katerina Makriyianni’s pieces are all made in Greece and inspired by Crete, so they are designed especially for island life. Sandra from 5 Inch and Up shows that these are a great way to liven up your everyday basics. Style Notes: New York newcomer Caroline Constas is finding her way into all of the most fashionable suitcases, with her signature off-the-shoulder tops, which have been championed by Leandra Medine, Pandora Sykes and Aimee Song (to name a few). Style Notes: It’s Jessica Stein’s job to dress for holidays (oh, the life of a full-time travel and fashion blogger). On her recent trip to Sri Lanka, she introduced us to Faithfull—a label which is targeted specifically at travellers and all of the pieces are handmade in Bali. Style Notes: Last summer, Kate Moss made a case for wearing your silk Olivia Von Halle PJs as an alternative to pool cover-ups, and Pernille Teisbaek shows that this isn’t just a look for supers. It’s a chic poolside option for those of you who are (or want to look like you are) spending the summer in close proximity to an infinity pool. Style Notes: Bikini brand Same Swim is becoming a favourite of the super-blogger set, and it’s no surprise, given the label was founded by Shea Marie of Peace Love Shea. Style Notes: Danielle from We Wore What chose this Riviera-ready tunic as a beach cover-up in Mexico, but it would easily also double up as a chic nighttime look. Style Notes: Pom-poms and woven baskets are both big news this summer, and Blair Eadie of Atlantic Pacific shows that you can do both at the same time with her monogrammed Rae Feather tote. Style Notes: Lucy Williams's linen Mango shorts she wore on a break in Lisbon will work for all of your summer escapes, whether on an island or in the city… And leave you with more money to spend on vino.